West, Ian M. 2017. Studland and Old Harry Rocks; References and Bibliography. Geology of the Wessex Coast of southern England. Internet site: www.southampton.ac.uk/~imw/Studland-Bibliography.htm. Version: 15th March 2017. World Heritage Site Proposal for The Dorset and East Devon Coast. 1:50,000, Sheet 195, Bournemouth and Purbeck. 1:25,000, Second Series, Sheet SY 87/97/SZ 07, Purbeck. 1:25,000, Second Series, Sheet SY 08, Poole Harbour. 1:10,000, Sheet SZ 08 NW, Northern dunes, Sandbanks. 1:10,000, Sheet SZ 08 SW, Southern dunes to northern part of Swanage Bay. 1:10,000, Sheet SZ 07 NW, Southern part of Swanage Bay, Durlston Bay. See Diver (1933) for listing of historic maps of the South Haven Peninsula. 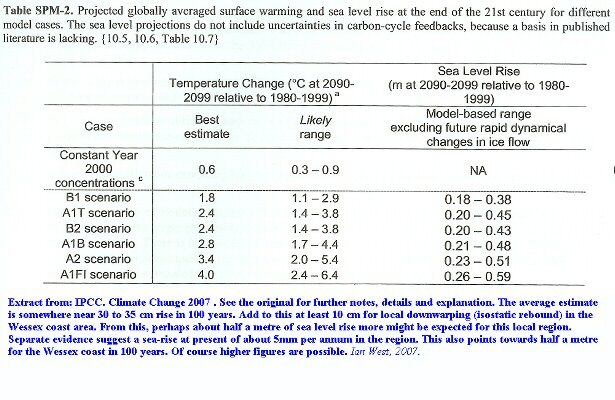 Aagaard , T., Orford, J. and Murray, A.S. 2006. Environmental controls on coastal dune formation; Skallingen Spit, Denmark. Geomorphology (in press), available on the internet - Science Direct, Elsevier. Abstract: Many coastal dune systems in Western Europe were emplaced during the Little Ice Age (LIA). The formation of such dune fields has generally been ascribed to a combination of low sea level and strong winds during that time period, providing a supply of sand from the exposed shoreface and sufficient wind energy to transport this sand landward. However, little information exists on the processes that controlled sediment supply to the beach and why this onshore supply was initiated at all. In this contribution, we consider the origin and development of older dune fields on a barrier spit complex (Skallingen) located in the northern part of the Danish Wadden Sea. Maps and new data on dune litho- and chrono-stratigraphy, the latter based on OSL-dating, allow a precise estimate of the initiation and termination of dune emplacement. Dune formation at Skallingen started at a relatively late stage of the LIA and it can be temporally correlated with a phase of relative sea level rise in North Western Europe and with a high frequency of storm surges along the Danish west coast. These are the conditions during which nearshore bars currently migrate onshore across the shoreface off Skallingen. The bars eventually merge with the beach and constitute a source of sand for modern foredune accretion. It is probable that the onshore bar migration occurred under similar conditions in the past and the migration was triggered, or enhanced, by the sea level recovery from the mid-LIA low-stand and the associated frequent storm surge activity. Consequently, at Skallingen onshore sand supply was caused by marine, rather than aeolian, agents; this supply provided the basis for subsequent dune formation. Indications are, however, that the sediment supply to the beach/dunes was a factor of 2-3 larger in the past. Dune aggradation eventually ceased around 1900AD because of dyke construction. Hence, the association between dune formation and sea level/surge variation at Skallingen is somewhat contrary to other statements of coastal dune development during the LIA in North Western Europe. Anderson, J.L. and Walker, I.J. 2006. Airflow and sand transport variations within a backshore-parabolic dune plain complex: NE Graham Island, British Columbia, Canada. Geomorphology, 77, Issues 1-2, 15 July 2006, 17-34. By Jeffrey L. Anderson and Ian J. Walker, Boundary Layer Airflow and Sediment Transport (BLAST) Laboratory, Department of Geography, University of Victoria, PO Box 3050, Station CSC, Victoria, British Columbia, Canada, V8W 3P5. The paper is available on the Internet. Abstract: Onshore aeolian sand transport beyond the beach and foredune is often overlooked in the morphodynamics and sediment budgets of sandy coastal systems. This study provides detailed measurements of airflow, sand transport (via saltation and modified suspension), vegetation density, and surface elevation changes over an extensive (325 times 30 m) "swath" of a backshore foredune-parabolic dune plain complex. Near-surface (30 cm) wind speeds on the backshore ranged from 4.3 to 7.3 m per sec, gusting to 14.0 m per sec. Oblique onshore flow is steered alongshore near the incipient foredune then landward into a trough blowout where streamline compression, flow acceleration to 1.8 times the incident speed, and increasing steadiness occur. Highest saltation rates occur in steady, topographically accelerated flow within the blowout. As such, the blowout acts as a conduit to channel flow and sand through the foredune into the foredune plain. Beyond the blowout, flow expands, vegetation roughness increases, and flow decelerates. Over the foredune plain, localized flow steering and acceleration to 1.6 times the incident speed occurs followed by a drop to 40% of incident flow speed in a densely vegetated zone upwind of an active parabolic dune at 250 m from the foredune. Sediment properties reflect variations in near-surface flow and transport processes. Well-sorted, fine skewed backshore sands become more poorly sorted and coarse skewed in the blowout due to winnowing of fines. Sorting improves and sands become fine skewed over the foredune plain toward the parabolic dune due to grainfall of finer sands winnowed from the beach and foredune. During the fall-winter season, significant amounts of sand (up to 110 kg per square metre) are transported via modified suspension and deposited as grainfall up to 300 m landward of the foredune. No distinct trend in grainfall was found, although most fell on the depositional lobe of the blowout and at 200 m near an isolated, active parabolic dune. Grainfall amounts may reflect several transporting events over the measurement period and the transport process is likely via localized, modified suspension from the crest of the foredune and other compound dune features in the foredune plain. This evidence suggests that the process of grainfall delivery, though often overlooked in coastal research, may be a key process in maintaining active dunes hundreds of metres from the shoreline in a densely vegetated foredune plain. The effectiveness of this process is controlled by seasonal changes in vegetation cover and wind strength as well as shorter term (e.g., tidally controlled) variations in sand availability from the beach. Arkell, W.J. 1934. Whitsun Field Meeting, 1934, The Isle of Purbeck. Proceedings of the Geologists' Association, 45, 412-419. Report by the Director, W.J. Arkell, M.A., D.Sc., F.G.S. "On Friday evening, May 18th, about 40 members and guests assembled at the headquarters in Swanage, Craigside Hotel, where the Director gave a short lantern lecture on the geology of the Isle of Purbeck. The routes to be taken on the four days of the field meeting were explained, and slides were shown illustrating the principal geological features to be visited. Saturday, May 19th. Swanage to Studland. The party made the trip to Studland by motor-boat, a special boat having been engaged from the Gondolier fleet of Poole. By coasting along the chalk cliffs from Ballard Paint to the Foreland a fine view was obtained of the Purbeck Thrust Fault, lit by the morning sun. The caves and pinnacles carved out of the chalk by the sea, and the stratification marked by the rows of flint nodules, showed to perfection. On landing at Studland, the way was first led along the beach northwards and up the new road to the top of the knoll by the Knoll House Hotel. From this view-point the Director gave a short resume of Captain Diver's interesting researches on the origin of Littlesea and the sand dunes spread out below. The first sharp rise ascended by the party was the old sea-cliff of the Eocene beds, which was traceable northwards all along the west shore of Littlesea. The broad belt of sandhills to the east of this consists of blown sand and is a recent accretion, far the most part grown up since the beginning of the Seventeenth Century. There are three main rows or ridges of sand. The first, or inner, ridge is covered entirely by heather and ling and looks from a little distance like the Eocene heath beyond Littlesea; the third or outer ridge is of fresh appearance, tufted only with marram grass. A hogs-back of sand on the beach, already colonised by marram grass, seems to be the embryo of a fourth dune ridge. The Director pleaded far the logical naming of the ridges in the order of their formation, the oldest being called the first, instead of in inverse order as had been done by Captain Diver. He also referred to the richness of these heaths in all forms of natural history products-entomological, botanical and zoological-and to the desirability of preventing, by farming a strong public opinion, their exploitation and permanent defacement for the enrichment of the speculative builder when the present ownership comes to an end. The Agglestone Rock was next visited, and its origin by weathering of the Bagshot Beds was discussed. The path through the heaths gave an opportunity to see something of the calcifuge flora-heather, heaths, gorse, sundew, etc. - typical of the Bagshot Beds and forming such a marked contrast with the floras of the Mesozoic rocks to be visited on the succeeding days. The walk back to Studland brought the party to the Banks Arms Hotel at 1 o'clock, where some had their lunch, which they had brought with them, while others preferred it on the beach below. After lunch the brightly variegated Bagshot Sands in the cliff at Redend Point were examined, and the origin of the long vertical pipes with ironstone linings formed a subject for speculation. The Director gave a short account of the Lower Tertiary strata of this end of the Hampshire Basin, referring especially to the westerly overlaps in the sequence, the passage of the Bagshots into gravel, and to the Poole and Wareham pottery industry. The junction of the Reading Beds and the Chalk were next examined in the southern corner of the bay, and the nature of the unconformity was discussed. From here the party ascended the cliff through the rather dense undergrowth and walked round the cliff-top to Swanage Bay. At Punfield Gap the Director gave an account of the" Punfield Beds" controversy and pointed out the exact positions of the Perna Bed, Judd's so called" marine band," and other features of interest. Members then examined the section, from the Wealden Shales to the Chalk, with the help of copies of the description culled from the various chapters of Strahan's memoir, which had been duplicated and handed out in the morning with diagrams of the cliffs and a geological map of Purbeck. The section was studied at some length, and members returned along the beach to Swanage at their leisure, in time for a late tea. The total distance walked was 6 miles. Sunday, May 20th. Durlston Bay and Tilly Whim Caves. In the morning some members made an unofficial excursion in private cars to Lulworth and the fossil forest. In the afternoon the whole party walked to Peveril Point and thence round Durlston Bay as far as the faults, to examine in detail the type section of the Purbeck Beds. Many fossils were collected from the Purbeck Marble, Corbula Beds, Cinder Bed, and Mammal Bed - the last yielding some very well preserved minute freshwater gastropods. Special attention was drawn to the zonal value in these strata of the ostracods, and to the work of Forbes, Rupert Jones, Koert, Maillard, Merrett and others in correlating them with the equivalent beds in Wiltshire and Oxfordshire, the Weald, Germany and the Jura Mountains. The Director also laid stress on the evidence of an important marine incursion all over the South of England during the Middle Purbeck, as shown by the Cinder Bed, and the presence of Hemicidaris, Trigonia, Perna, Mytilus, Pecten, Protocardia, etc., and many marine fish, in the Cinder and Feather Beds and the Purbeck Building Stones. In spite of Salfeld's correlation of the German Serpulite with the Cherty Series of the Portland Stone, which also abounds in Serpulae, the Director held strongly that the view of all the earlier geologists was right; namely, that the Serpulite was the equivalent of the Middle Purbeck Beds and the Munder Marls of the Lower Purbeck Beds. All the evidence of the Ostracods and other fauna, as well as the detailed lithology of the whole Purbeck series, is in agreement with this view; and the Serpula of the Serpulite is S. coacervata Blumb.., which occurs in the Cinder Bed, while that in the Portland Stone is S. gordialis Schloth., which is not known in the Serpulite (See Arkell, 1933, pp. 550-1). Two interesting palceontological finds were mentioned by the Director; the discovery by Professor Hawkins of a colony of the rare Hemicidaris purbeckensis, comprising 38 tests and fragments of tests, in the Cinder Bed at this point (Quart. Journ. Geol. Soc., 1925, vo1. lxxxi, p. cxxviii) and the finding by himself last summer, in a thin band of mudstone a few feet below the Feather Bed, of numerous specimens of Archaeoniscus brodiei. This Isopod occurs in myriads in a similar bed in the Middle Purbeck of the Vale of Wardour, but it had not been previously located on the same horizon in Purbeck. The party, although numerous, were unsuccessful in finding Hemicidaris, Trigonia, Archaeoniscus or mammals. The Purbeck Beds, although highly fossiliferous, require much patient search to yield results. Climbing up the zig-zag path below Middle Durlston, the party walked to Durlston Castle for tea, and afterwards on to Tilly Whim Caves. At the end of the descent of the tunnel a short account was given of the succession of the Portland Stone displayed, special reference being made to the oyster bed and to the quarrying industry here and in Purbeck generally. In Grabau's "Text-book of Geology" (1920, pp. 812-3) are two photographs of Tilly Whim headed" Elevated sea-caves cut by waves in horizontal Jurassic strata." But we owe to Thomas Webster, who first explored this coast geologically on behalf of Sir H. Englefield ("Picturesque Beauties of the Isle of Wight," 1816, plate 33) an accurate engraving of the" caves" as they appeared in 1811, with the quarrymen still at work. Quarrying, in fact, has alone been responsible for the cutting of these and the many similar galleries and ledges between Durlston and St. Albans Heads. Some of the party inspected Anvil Point lighthouse, and all found their way home on foot in their own time. Monday, May 21st. Winspit, St. Alban's Head and Chapman's Pool. Leaving the motor-coaches at Worth Matravers, members descended the valley to Winspit, where they studied the whole succession of the Portland Stone down to below the middle of the Cherty Series. The Freestone Series was studied in the abandoned quarries and the Cherty Series in the cliff-path and sea-ledges below, where a serpulite composed of S. gordialis is well exposed. At the end of the coastguards' path to St. Alban's Head, another quarry in the upper part of the Freestone Series was visited on the point of the headland. Here the Under Freestone has become thin and cherty and is not worked, and the floor of the quarry is formed by the Chert Vein, the stone wrought being the Pon or Pond Freestone. This quarry provides a particularly fine section of the Shrimp Bed and Purbeck Caps. On emerging from the quarry a visit was paid to the Norman chapel before beginning the descent of Pier Bottom to Chapman's Pool, where lunch was taken on the grass slope above the Pool. From this vantage point the Director gave an account of the stratigraphy of the Portland Sand and Upper Kimeridge Clay of the surrounding cliffs; and drew attention to the reexcavated valleys here and at Winspit, mentioned in a recent paper by Mr. Burton (1932). The afternoon was quickly passed on the shore of Chapman's Pool and under Hounstout, collecting ammonites (chiefly Pavlovia rotunda and allied forms) from the Rotunda Nodules and Crushed Ammonoid Shales. The party then walked up Coomb Bottom and by way of Renscombe Farm to Worth. Tea was spread ready in the garden of the Post Office stores. After tea the motor-coaches were taken to Corfe, where some members alighted to see the castle, while the main body turned south to visit the remarkable tufa deposit near Blashenwell. The quarry still showed a good section about 5 ft. deep, and numerous land gastropods and artificially flaked flint chips were soon found, together with plant impressions, and some charcoal and limpets, left by the Neolithic men who worked the flints. A lively discussion arose as to the mode of origin of the deposit (see Reid, 1896). On the way the motor-coaches were stopped at Kingston to visit the Eldon memorial church, built entirely of Portland Stone and Purbeck Marble quarried on the estate. Opened in 1880, it is the last example of an extensive use of the Viviparus marble, and is most effective. The total walking distance during the day was 7 miles." Ameen , M.S. and Cosgrove, J.W. 1990. Kinematic analysis of the Ballard Fault, Swanage, Dorset. Proceedings of the Geologists' Association, 101, 119-129. Meso-fractures in the vicinity of the Ballard fault which occurs in the steep limb of the Purbeck - Isle of Wight monocline, southern England are used to settle a long-standing controversy concerning the sense of movement on this fault and its age relative to the monocline. Two groups of meso-fractures are recognised, one which is systematically orientated with respect to the bedding and which occurs throughout the monocline and another which is restricted to the footwall of the fault. By considering these fractures and and recent developments in the understanding of the regional geology of the region, it is possible to argue that the Ballard fault is a ramp structure associated with a northward moving thrust which was subsequently folded as the Purbeck - Isle of Wight monocline amplified. Deflection of the local fractures and the bedding close to the fault indicate clearly that the latest movements on the fault were opposed to this thrusting and it is probable that this later movement occurred during amplification of the monocline either in association with or as an alternative to bedding plane slip. Azevedo , T.M., Abreu, M.M., Coutinho, M.A. and Figueiras, J. 2006. The origin of the Pedra Furada sandstone tubular structures (South of Lisbon, Portugal).Geomorphology, vol. 82, Issues 3-4, December 2006, pp. 245-254. By T.M. Azev�do, M.M. Abreu, M. Azevedo Coutinho and J. Figueiras. Abstract: The Pedra Furada is a 12 m wide, 18 m high outcrop feature showing hundreds of ferruginised sandy tubes and looking in part like a giant organ. In this paper the origin of the tubes is explained on the basis of geochemical, petrographic and microscopic (optical and electronic) analytical data. The tubes are considered to represent vertical escape channels for overpressured water, exhibiting inward decreasing grain size due to water velocity gradients inside the escape channels. The ferruginisation is due to iron oxides associated with colloidal/clayey fine sediments and to goethite formed from solution. The overpressure of water may be due to seismically fluidised beds below the Pedra Furada outcrop or to artesian water ascent. In both cases, fault rupturing may have played a major role in the focussing of the ascending flow. [also available online]. Bevan , T.G. 1985. A reinterpretation of fault systems in the Upper Cretaceous rocks of the Dorset coast, England. Proceedings of the Geologists' Association, London, 96, 337-342. Mesofault systems in the Upper Cretaceous rocks of the steep limb of the Purbeck monocline are reinterpretated by analysing their geometry with reference to the orientation of sedimentary layers. As a consequence of using layering as a datum rather than the horizontal, the five original groups of mesofaults, previously recognised by Arkell and Phillips, have been condensed into two sets of conjugate extension faults. These faults are symmetrically arranged about the layering, the dip of which varies from vertical to steeply inclined. Mesofaults previously considered to have been generated during a complicated history of thrusting, related to the tightening of the synformal bend of the monocline and horizontal compression, are reinterpreted as being the result of layer-parallel extension during flexuring. Thus they are accomodation structures formed during the development of the monocline, itself related to drape over reactivated Jurassic growth faults during N-S shortening. South-dipping reverse macrofaults are reinterpreted as being the continuation to the surface of the reactivated Jurassic growth-faults, whilst north-dipping reverse macrofaults are interpreted as being antithetic to these reactivated faults. A tectonic implication arising from the proposed kinematic classification of the mesofaults is that they can be perceived as being the product of stretching of a steep fold limb during flexuring, rather than being related to several phases of horizontal compression. Bird , E. 1995. Geology and Scenery of Dorset. Ex Libris Press, 1 The Shambles, Bradford on Avon, Wiltshire. 207 pp. ISBN 0 948578 72 6. By the late Eric Bird of Abbotsbury, Dorset. Copyright Geostudies, 1995. Black and white, soft cover book, original price - �8.95p. 31 maps, diagrams and cross-sections, 58 monochrome photographs, notes, references and index. Bowen , H.C. and Fowler, P.J. 19?? Earthwork circles and mounds at Studland Heath, Dorset. Antiquity, vol. 37. Boxall , S.R. 1989. Environmental Monitoring Poole Bay 1989. Surface Drifter Study: Block 98/6 for BP Exploration. Southampton University, Southampton. Brannon , P. 1860. The Illustrated Historical and Picturesque Guide to Swanage and the Isle of Purbeck with a Clear Digest of the Geology and a Minute Description of the Coast from Bournemouth Bay to White Nore. Published by R. Sydenham, London, Longman and Company. 106pp. By Philip Brannon, Archt. C.E. etc., 12 Portland Terrace, Southampton, 2nd Edition. Local publisher was Mr. Richard Sydenham of Poole. Braye , J. 1890. Swanage (Isle of Purbeck): Its History, Resources as an Invigorating Health Resort, Botany and Geology. 2nd Edition. William Henry Everett and Son, Salisbury Square, Fleet Street, London, 119 pp. (John Braye). Price One Shilling. Bristow, R., Mortimore, R. and Wood, C. 1997. Lithostratigraphy for mapping the Chalk of southern England. By Roger Bristow, Rory Mortimore and Christopher Wood. Proceedings of the Geologists' Association, London, Vol. 108, Issue 4, pp. 293-315. Recent British Geological Survey (BGS) mapping in Dorset, Wiltshire, Hampshire, Sussex and Kent has shown that the Lower, Middle and Upper Chalk formations of the Chalk Group, can be subdivided into mappable units of member status. The members are recognizable by their lithology and topographic expression, and can be followed readily across open country. Some members have distinctive wireline log signatures. These members will be shown on future BGS maps. In the above areas, the Lower Chalk (Formation), with its traditional boundaries, is retained and divided into two members, a lower, West Melbury Marly Chalk, comprising, in part, the Glauconitic Marl, most of the Chalk Marl up to and including the Tenuis Limestone; and a higher, Zig Zag Chalk, comprising the top of the Chalk Marl, the Grey Chalk and the Plenus Marls. These members can be readily traced from Dorset and Wiltshire into Sussex and Kent. In the Chiltems, the Glauconitic Marl (s.s.) forms a third, basal, mappable member to the Lower Chalk. The Middle Chalk (Formation) consists of two members: the redefined Holywell Nodular Chalk, comprising the Melbourn Rock and overlying Mytiloides shell-detrital chalks; and the New Pit Chalk, a massively bedded chalk with conspicuous marl seams. The traditional concept defining the base of the Upper Chalk (Formation) at the entry of common flint is too variable and unreliable for mapping. Instead, the base of the Upper Chalk is coincident with a revised base to the Lewes Nodular Chalk, defined by the entry of hard nodular chalk in basinal successions, by the base of the Chalk Rock in condensed marginal successions and the base of the Spurious Chalk Rock in south Dorset and the Isle of Wight. The Upper Chalk is subdivided into a basic framework of 8 members. The coarse-grained, rough Lewes Nodular Chalk is succeeded by very fine grained, smooth chalks, marl-free except at the base, with conspicuous bands of large flints, the Seaford Chalk. The overlying Newhaven Chalk is characterized by firm, marly chalk with numerous marl seams and regular, but fewer, bands of flint. The marl seams locally thin or disappear over tectonic highs. In central Dorset, the base of Newhaven Chalk cannot be mapped, leaving an undivided Seaford and Newhaven Chalk, later renamed Blandford Chalk; the latter name is herein discontinued. In parts of east Kent (Thanet), the Seaford Chalk is overlain by very soft, nearly flint-free chalk, the Margate Chalk. The bases of the Tarrant Chalk and Spetisbury Chalk are defined by the crests of prominent scarp features Ftl and Ft2 in central Dorset. The origin of the features, due to lack of exposure of the feature-forming beds, remains uncertain. These members comprise uniform, firm, white, flinty chalks and collectively, e.g. where not mapped separately, constitute the Culver Chalk of the existing classification. The lower limit of the Portsdown Chalk, with numerous marl seams, is taken at a pronounced negative feature break in central Dorset (base of Ft3 scarp), that approximates to the base of the member as originally defined. The terminal member in Dorset and the Isle of Wight (Studland Chalk), comprising soft, white, marl-free chalk with very large flints, is mapped with the Portsdown Chalk as it is not readily separable from the latter unit. British Geological Survey (BGS). (Compiled by M.A. Woods) 2011. Geology of South Dorset and South-East Devon and its World Heritage Coast. Special Memoir for 1:50,000 geological sheets 328 Dorchester, 342 West Fleet and Weymouth and 342/343 Swanage and parts of sheets 326/340 Sidmouth, 327 Bridport, 329 Bournemouth and 330 Newton Abbott. Compile by M.A. Woods. By Barton, C.M., Woods, M.A., Bristow, C.R., Newell, A.J., Westhead, R.K., Evans, D.J., Kirby G.A., and Warrington, G. Contributors: Biostratigraphy - J.B. Riding; Stratigraphy - E.C. Freshney; Economic Geology - D.E. Highley and G.K. Lott; Engineering Geology - A. Forster and A. Gibson. British Geological Survey, Keyworth, Nottingham, 2011. 161 pp. This is the new version of the Geological Survey Memoir for the Dorset Coast etc. and replaces Arkell (1947) and the earlier memoir by Strahan (1898). It covers a wider area than these old memoirs, though, and includes all of "Jurassic Coast", UNESCO World Heritage Coast. It is a key reference work. Available from BGS Online Bookshop at 24 pounds stirling (in Jan. 2012). Chalk Group Macrofossils from the Basingstoke (Sheet 284) and Aldershot (Sheet 285) districts. Bruce , P. 1989. Inshore along the Dorset Coast. Boldre Marine, Lymington. 115pp and maps. By Peter Bruce. First Edition. Bruce , P. 1996. Inshore along the Dorset Coast. Boldre Marine, Lymington. Second Edition. Bruce , P. 2001. Inshore along the Dorset Coast. Boldre Marine, Lymington. Third Edition, 133pp with excellent aerial and coastal colour photographs and a location maps. Brunsden , D. and Goudie, A. 1981. Classic Coastal Landforms of Dorset. Geographical Association, Landform Guides, No. 1, 39 pp. Canning , A. D. and Maxted, K.R. 1979 (reprinted 1983). Coastal Studies in Purbeck: A Geographical Guide. Printed and Published by the Purbeck Press, Swanage, Dorset. 86 pp., paperback, ISBN 0 906406 07 2. Carr , A.P. 1971. South Haven Peninsula; physiographical changes in the twentieth century. Pp 32-38 in: Merrett, P.M. 1971. Captain Cyril Diver: a Memoir. Nature Conservancy, Furzebrook, Wareham, Dorset. Carter , D.C. 1992. An upper strain detachment model for the Ballard Fault: a discussion. Proceedings of the Geologists' Association, 102, 309-315. This model is supported by a seismic study by Underhill and Patterson. "By contrast, the seismic data is entirely consistent with Carter's model which requires the least dramatic structural geometry at seismic scale. The implication from the seismic data is that the Ballard Down Fault is a local late-stage backthrust superimposed upon the earlier and more structurally significant Purbeck disturbance." Cochrane , C. 1971. Poole Bay and Purbeck 300BC - AD1600. Longmans, Dorchester. Cooper , N.J. and Harlow, D.A. 1998. Beach replenishment: implications for sources and longevity from results of the Bournemouth schemes. Chapter 13, pp. 162-177 in: Hooke, J. 1998. Coastal Defence and Earth Science Conservation. The Geological Society, London, 270pp. Summary: Beach replenishment is an effective shoreline management tool which can restore immediately coast protection and amenity functions of a beach. Issues concerning material sources and replenishment scheme longevity need to be addressed as future scheme use proliferates. From analysis of a long-term beach monitoring record in Poole Bay, southern England, it is suggested that a viable trade-off can be made between tight particle size grading control and the presence of retention structures in the design of effective replenishment schemes. The conservation of sediment resources is essential if replenishment is to be a sustainable option in the longer term. Cope, J.C.W. 2006. Upper Cretaceous palaeogeography of the British Isles and adjacent areas Proceedings of the Geologists' Association, London, 117, 129-143. By Professor John Cope, Department of Geology. National Museum of Wales, Cathays Park, Cardiff CFIO 3NP. UK. Copland , W.O. and Overton, J.M. 1976. Environmental Studies in Purbeck: Handbook . Dorset County Council, First Published in 1976 by Globe Education, a division of Macmillan Education Ltd., Houndmills, Basingstoke, Hampshire, 72 pp. By W.O. Copland, Senior Advisor, South-East Dorset, Dorset Education Committee, and J.M. Overton, Principal, Leeson House Field Centre, Dorset Education Committee. Also a Second Revised Edition in 1996 by D.M. Kemp, 87pp. The original edition was part of a boxed set with various environmental pamphlets and with colour slides. Damon , R.F., 1884. Geology of Weymouth, Portland and the Coast of Dorsetshire from Swanage to Bridport-on- the-Sea: with Natural History and Archaeological Notes. 2nd ed., R.F. Damon, Weymouth, 250 pp. Davies , G.M. 1956. The Dorset Coast; A Geological Guide. 2nd Edition, Adam and Charles Black, London. 128pp. (the 2nd Edition follows a 1935 Edition). By G.M. Davies, originally, in 1935, of Birkbeck College, University of London. Digs Digest . A newsletter on Dorset's Important Geological/Geomorphological Sites. It is photocopied and distributed by Dorset Wildlife Trust on behalf of DIGS. Diver, C. and Diver, P. 1933. Contributions towards a survey of the plants and animals of South Haven Peninsula, Studland Heath: 3 Orthoptera. Journal of Animal Ecology, No. 2. English Nature . 19?? Studland Heath National Nature Reserve. The Sand Dunes Nature Trail. Leaflet. English Nature. 19?? Studland Heath National Nature Reserve. Woodland Trail. Leaflet. English Nature. 19?? Studland Heath National Nature Reserve. Reserve Leaflet. Ensom, P. and Turnbull, M. 2011. 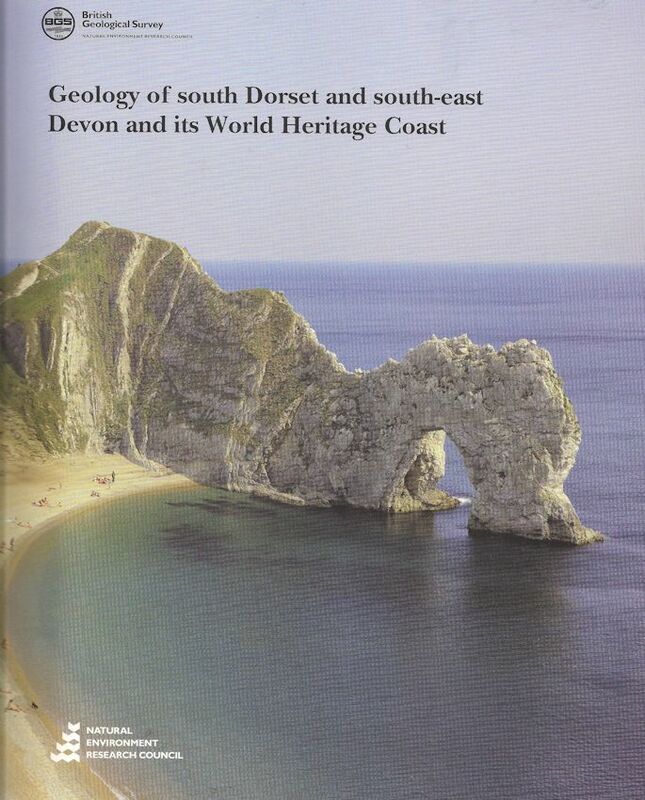 Geology of the Jurassic Coast; The Isle of Purbeck; Weymouth to Studland.. By Paul Ensom and Malcolm Turnbull. Jurassic Coast Trust. Coastal Publishing, Wareham. 128pp. Price �9. 95p. This is a very well-illustrated guide with many good colour photographs that are labelled in terms of stratal units. The text is in easily-readable, non-specialist language. There is a glossary for non-geologists. Some further reading is given in a list at the back. Gale , A.S. 1996. Correlation and sequence stratigraphy of the Turonian Chalk of southern England. Sequence stratigraphy in the United Kingdom. In: Hesselbo, S.P. and Parkinson, D.N. (eds.) , Sequence Stratigraphy in British Geology. Geological Society, London, Special Publication 103, 177-195. Gale, A.S., Wood, C.J. and Bromley, R.G. 1988. The lithostratigraphy and marker bed correlation of the White Chalk (Late Cenomanian - Campanian) in southern England. Mesozoic Research, 1, 107-118. Gale A.S., Young, J.R., Shackleton, N.J., et al. 1999. Orbital tuning of Cenomanian marly chalk successions: towards a Milankovitch time-scale for the Late Cretaceous. Philosophical Transactions of the Royal Society, Series A, 357, (1757), 1815-1829. July, 1999. (Relevant to cyclical sequences in the Lower Chalk). Mortimore, R.N., Wood, C.J. and Gallois, R.W. 2001. British Upper Cretaceous Stratigraphy. Geological Conservation Review Series (GCR), Volume No. 23. Joint Nature Conservation Committee (JNCC), UK. Handfast Point to Ballard Point (OS. Grid Ref: SZ043824 - SZ048813), Geological Conservation Review, Vol. 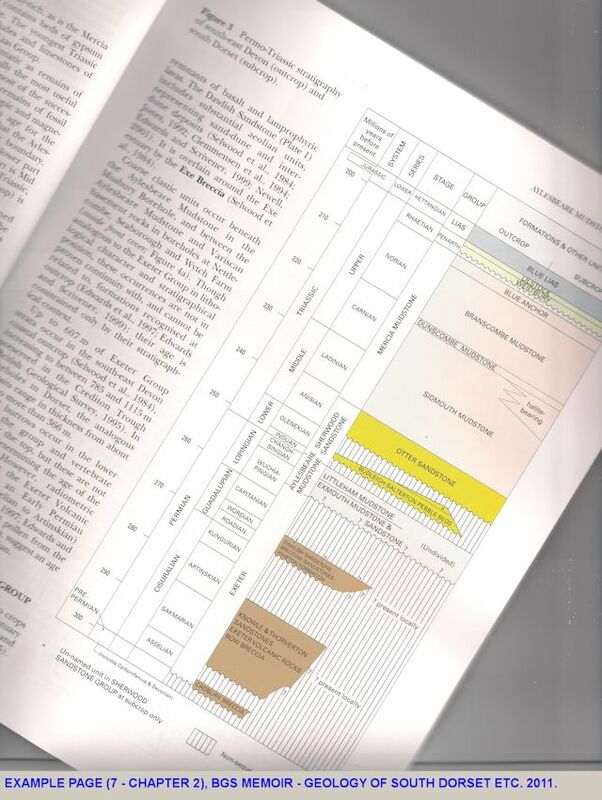 23: British Upper Cretaceous Stratigraphy, Chapter 3, Southern Province, England. 11 pp. "Introduction: The Handfast Point to Ballard Point GCR site, near Studland, Dorset (Figures 3.53 and 3.54), is perhaps the most inaccessible and inhospitable Upper Cretaceous section of all the Upper Cretaceous GCR sites. As Rowe (1901, p. 37) indicated, however, it is also the most important section in the Upper Campanian Belemnitella mucronata Zone, but this can only be worked by boat." Gimmington , C.H. 1972. Ecology of Heathlands. Chapman and Hall. Good , R. 1935. Contributions towards a survey of the plants and animals of South Haven Peninsula, Studland Heath, Dorset: 2 General ecology of flowering plants and ferns. Journal of Ecology, vol. 23. Green , F.H.W. 1940. Poole Harbour: A Hydrographic Survey. Published for the Poole Harbour Commissioners and University College, Southampton, by Geographical Publications Ltd., London. 48 pp with maps, diagrams and tables. By F.H.W. Green, Lecturer in Geography, University College Southampton (on H.M.S. Edinburgh in October, 1939). Based on work undertaken by Mr Green with students and graduate students in 1938 and 1939 after consultation with Miss F.C. Miller, Senior Geography Lecturer and with the approval of the Principal of Southampton University College, K.C. Vickers. With a foreword by Alderman Herbert S. Carter, J.P, C.C., Chairman of the Poole Harbour Dredging and Lighting Committee. Haigh , M.J. 1975. A biogeographical reconnaissance of the coastal marshlands of Poole Harbour, Dorset. Hamblin , R.J.O., Crosby, A., Balson, P.S., Jones, S.M., Chadwick, R.A., Penn, I.E. and Arthur, M.J. 1992. The Geology of the English Channel. British Geological Survey. United Kingdom Offshore Regional Report. London , Her Majesty's Stationery Office. 106 pp. ISBN 0-11-884490-3. [see particularly Chapter 9, Quaternary, pp 75-88, although not detailed with regard to the Studland area]. Hardy , W.M. 1910. Old Swanage or Purbeck Past and Present: A collection of articles, topographical, historical, antiquarian, biographical and anecdotal. New and revised edition with three supplementary chapters. Dorset County Chronicle Printing Works, Dorchester. 264 pp. By Williams Masters Hardy, author of "Smuggling Days in Purbeck", etc. With twenty-eight full page illustrations, including reproductions of rare prints. Hinchcliffe , J. and Hinchcliffe, V. 19?? Dive Dorset. Underwater Publications Ltd., ISBN 0946020035. Hubbard , J.C.E. 1965. Spartina marshes in southern England: VI pattern of invasion in Poole Harbour. Journal of Ecology, 53. Hydrographer to the Navy . 1987. Admiralty Chart 2175 - Poole Bay. Hydrographic Office, Taunton. Jarvis , K.S. 1990. Underwater Sites in Poole and Studland Bays. Poole Museum, Poole. Johnston , P.M. 1918. Studland Church and some remarks on Norman Corbel Tables. Journal of the British Archaeological Association, 1918. Jukes-Browne , A.J. 1893. The amount of desseminated silica in Chalk considered in relation to flints. Geological Magazine, 30, 541-546. Jukes-Browne, A.J. 1906. The zones of the Lower Chalk. Geological Magazine, vol. 43, pp. 507-511. Kemp , D.M. 1996. Environmental Studies in Purbeck: Handbook. Revised Edition of: Copland, W.O. and Overton, J.M. 1976. Environmental Studies in Purbeck: Handbook . Dorset County Council, First Published in 1976 by Globe Education, a division of Macmillan Education Ltd., Houndmills, Basingstoke, Hampshire, 72 pp. By W.O. Copland, Senior Advisor, South-East Dorset, Dorset Education Committee, and J.M. Overton, Principal, Leeson House Field Centre, Dorset Education Committee. The original edition was part of a boxed set. Lack , D. and Venables, L.S.V. 19?? The heathland birds of South Haven Peninsula, Studland Heath, Dorset. Journal of Animal Ecology, vol. 6. Laddle , L. 1993. The Studland Bay Wreck: a Spanish Shipwreck off the Dorset Coast. Poole Museum Service, Poole, Dorset. Poole Museum Heritage Series No. 1, 28 pp. (24 cm.). By Lillian Ladle. Legg, R. 1987. Purbeck's Heath: Claypits, Nature and the Oilfield. Dorset Publishing Company, Sherborne, Dorset, ISBN 0 902129 79 1. Legg, R. 1989. Purbeck Island. 2nd Revised Edition (first published in 1972). Dorset Publishing Company at the Wincanton Press, Wincanton, Somerset. ISBN 0 948699 08 6. 230 pp. (Much useful historic and topographic and some geological information. Short sections on dinosaur footprints, quarries etc). Madsen, H. B. and Stemmerik, L. 2010. Diagenesis of flint and porcellanite in the Maastrichtian Chalk at Stevns. Journal of Sedimentary Research, vol. 80, pp. 578-588. By Heine Buus Madsen and L. Stemmerik, of Copenhagen. Available online from SEPM (Society for Sedimentary Geology) as a pdf file. Flint is common in many successions, but since the nodules can be the result of a series of replacement and void filling processes, their origin and broader paleo-oceanographic significance can remain enigmatic. This study addresses the origin of flint, in the Campanian�Maastrichtian chalk of Denmark using the 450-m-long Stevns-1 core as a natural laboratory. Four types of siliceous nodules occur in the core: porcellanite, white flint, white flint with a core of dark flint, and dark flint. All nodules consist mainly of microquartz with subordinate lutecite, spherulitic chalcedony, megaquartz, and dolomite. The lutecite replaces macrofossil fragments, mainly bryozoans and shells, microquartz replaces coccoliths, and the chalcedony and megaquartz are pore-filling. The preservation of the external shape of bryozoans, shells, and coccoliths suggest that siliceous nodules were formed early by a one-by-one volume replacement of chalk. Values of d18 O smow of microquartz and lutecite around 33% indicate temperatures of 15�17 degrees C at the time of precipitation; in contrast, the d18 O smow values of megaquartz indicate precipitation at temperatures up to 48 degrees C. The occurrence of chalcedony together with more stable and ordered megaquartz in irregular voids indicates that silica gel and/or opal-CT transformed to the a-quartz phases, microquartz, lutecite, chalcedony, and megaquartz, through the dissolution�precipitation process (Ostwald ripening). These results motivate a conceptual model in which the replacement process was initiated by microbial decomposition of organic matter and took place during periods of low rate of, or even stopped, sedimentation which fixed the redox boundary and the microbial metabolic zones at a specific depth below the sea floor. Biogenic opal-A incorporated in the sediment column below the sea floor was dissolved and precipitated at the redox boundary as silica gel and/or opal-CT, possibly aided by sulfide oxidizing bacteria. During burial, the dissolution�precipitation process transformed the silica gel and opal-CT to the a-quartz phases. The results of this study indicate that precipitation of the flint precursor can be controlled by a combination of an abundant biosiliceous source and high microbial activity in the sediments immediately below the seafloor. Flint is therefore likely to reflect deposition in a narrow interval at relatively shallow depths and therefore might be useful in studies of shallow-water carbonates. Mansel-Pleydell , J.C. 1888. Meeting at Poole; account of the geology of the district. Proceedings of the Dorset Natural History and Antiquarian Field Club, 9, xxxv - xxxviii. With notes by Mr. W. Penny. Marex Technology Ltd . 1990. A Survey of Currents in Poole Bay. Volume 1. May , V.J. 1968. Reclamation and shoreline changes in Poole Harbour. Proceedings of Dorset Natural History and Archaeological Society, vol. 90. May , V.J. 19??. Poole Harbour and the Isle of Purbeck. Chapter in: Field Studies in South Hampshire, Geographical Association. May, V. 2008. Geomorphology of Dorset: a Review. Proceedings of the Dorset Natural History and Archaeological Society, 129, 2008, 149-162. By Professor Vincent May, Bournemouth University, Talbot Campus, Fern Barrow, Poole, BH12 5BB. [This paper discusses a wide range of topics including the origin of the Chesil Beach, the entrance of Poole Harbour, sand dunes of Studland, the Axe estuary, offshore ledges at Worbarrow Bay, lack of a submerged channel off Lulworth Cove, conservation and RIGS sites etc. It includes various reference, some of which are not well known and some of which are unpublished Ph.D theses of Bournemouth University (e.g. Cook, 2007 - Studland peninsula; Drayson 2005 - Weymouth Bay acoustic). May , V.J. and Heeps, C. 1985. The nature and rates of change on a chalk coastline. Zeitscrift fur Geomorphologie N.F., Supplement, Bd. 57, 81-94. May and Heeps (1985) illustrated the development of stacks on a chalk coast at Ballard Down, using maps of four different editions during almost one hundred years (1887-1982). Merrett , P.M. 1971. Captain Cyril Diver: a Memoir. Nature Conservancy, Furzebrook, Wareham, Dorset. Morris , S. 2005. Strip search: police prepare to shed uniforms to patrol naturist beach. The Guardian Newspaper, July, 22, 2005, page 9. "As part of Operation Coast, officers in Dorset are trying to blend in with naturists at Studland Beach to try to catch so-called d...... Studland Beach which is managed by the National Trust has been a favourite with naturists since the 1920s. But in recent years it has been blighted by the appearance of d...... Dorset police have produced a leaflet which will be handed out to beach users, warning them that uniform and undercover officers will be patrolling... An undercover female officer, for example, arrested a 45 year old landscape gardener for outraging public decency after he approached her while she was sitting on a sand dune.....Last summer 16 people were arrested for outraging public decency at Studland Beach.."
Mortimore, R.N., Wood, C.J. and Gallois, R.W. 2001. British Upper Cretaceous Stratigraphy. Geological Conservation Review Series (GCR), Volume No. 23. Joint Nature Conservation Committee (JNCC), UK. 558 pp., illustrations, A4 Hardback, ISBN 1 86107 488 3. Chapter 1 and Chapter 3 are available free as pdf files online. Price for the thick book, in 2009, - 53 pounds sterling. This volume provides a comprehensive explanation of the geology and the geological significance of 37 GCR sites across the British Isles from coastal cliffs to individual small chalk pits. Upper Cretaceous rocks, primarily Chalk, cover a vast area of England forming the Downs and Wolds as well as the spectacular chalk cliffs from Flamborough Head to south-east Devon. In south-east Devon and the Inner Hebrides of north-west Scotland, white chalk rests on greensands, calcareous sands and commercially important quartz sandstones. Scientific knowledge of these rocks is an essential part of planning construction projects, developing and protecting groundwater resources and utilising the materials such as flint, chalk and sands for industrial processes. Historically, the fossils from the Chalk, such as the echinoid Micraster, have made major contributions to evolutionary studies. Fossils, combined with detailed analyses of the structure and sedimentology of the Chalk and associated rocks, continue to be a focus for developing new ideas in stratigraphy, modelling past climates and investigating biodiversity and mass extinctions. Thirty-seven GCR sites across the British Isles are described and linked to numerous other sites to provide a comprehensive explanation of the geology and the geological significance of each GCR site. Individual sites vary from coastal cliffs, many kilometres long, to individual small chalk pits. Where possible, sites have been extensively re-investigated to provide the most up-to-date reviews. Moses, C. and Robinson, D. 2011. Chalk coast dynamics: Implications for understanding rock coast evolution. Earth Science Reviews, vol. 109, Issues 3-4, December 2011, pp. 63-73. By Cherith Moses and David Robinson, Department of Geography, University of Sussex, Falmer, Brighton, BN1 9SJ, UK. Rock cliffs and shore platforms are linked components of the world's coastal zone. Understanding of the dynamics of their relationships has been hindered by the often imperceptible changes that occur within human time scales. 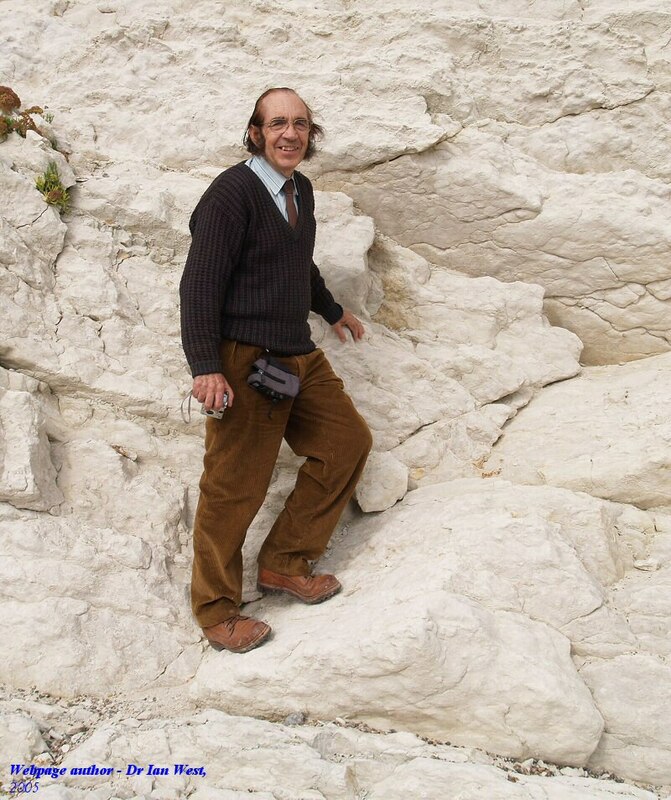 The Cretaceous Chalk coasts of northwest Europe, and particularly those of southeast England, are among the most dynamic, and most intensively studied, cliffed rock coasts in the world. Perceptible changes to both cliffs and platforms have been measured on monthly, seasonal, annual and decadal time scales. Through a review of previously published data and the addition of data not previously published, average cliff retreat rates are calculated as 0.49 � 0.38 m y- 1 and platform erosion rates 3.999 � 3.208 mm y- 1. This paper highlights some of the interactions over time and space between process and measurement that continue to limit our understanding of the dynamics of rock coasts; in particular the link between rates of cliff retreat and platform erosion. It concludes by identifying fruitful areas for future research. National Trust . 19? ?, Brownsea Geology Trail - Leaflet. Available from the National Trust Office, Brownsea Island. Nature Conservancy Council . 19?. Studland Heath National Nature Reserve Leaflet. Nature Conservancy Council. 19? . The Sand Dunes Nature Trail Studland Heath National Nature Reserve Leaflet. Nature Conservancy Council. 19?. Woodland Trail Studland Heath National Nature Reserve Leaflet. Oliver , B.R. 1990. Marine Study of Poole Bay. Report to BP Exploration. Maritime Operations Centre, Southampton Institute, Southampton. Ordnance Survey, 1:25,000 maps, Outdoor Leisure Series, 15, Purbeck and South Dorset. A specially designed map of this popular recreational area. This is the recommended topographic map for geologists using the area. It includes the South Haven Peninsula and Studland and Harry Rocks. Larger scale maps - 1:10,000, and 1:2,500 can be obtained from map suppliers for specific areas, as might be needed for student project work or research. References for the larger scale maps can be obtained from the National Grid which is shown on the 1:25,000 map. Aerial photographs are also available from the Ordnance Survey. Payne , D. 1953. Dorset Harbours. Christopher Johnson, London. 156pp. By Donald Payne, with a foreword by Vernon C. Boyle. Perkins , J.W. 1977. Geology Explained in Dorset. David and Charles, Newton Abbot, 224 pp. ISBN 0-7153-7319-6. A good explanation of Dorset geology with well-labelled diagrams. Out of print. See these important documents on the plans for the coastal management or shoreline management of the area. Summarised contents of a version are given below and look for the section of interest. However, this SMP is not the final version, and there will be an update. If you do not find it directly from the links here, search by Google etc for the latest version, using the keywords - "Poole Christchurch SMP". Poole and Christchurch Bays Coastal Management Plan (or SMP - Shoreline Management Plan). Draft SMP2. Draft version of the SMP, later to be replaced by final version (see this when it is available. SMP2 is due to be published in April 2010.). Available online as PDFs at Poole and Christchurch Bays Coastal Management Plan. Section 4.2, Policy Development Zone 1 Central and Eastern Sections of Christchurch Bay (Hurst Spit to Friars Cliff). Section 4.3, Policy Development Zone 2 Christchurch Harbour and Central Poole Bay (Friars Cliff to Flag Head Chine). Section 4.4, Policy Development Zone 3 Poole Harbour and Associated Coastline (Flag Head Chine to Handfast Point, including Poole Harbour). Section 4.5, Policy Development Zone 4 Swanage (Handfast Point to Durlston Head). Section 6, Policy Summary, including Policy Summary Map. Appendix C, Baseline Process Understanding, including Coastal Process Report and Flood and Erosion Mapping. Accessible from a separate page including No Active Intervention (NAI) and With Present Management (WPM) assessments, and summaries of the data used in assessments. Appendix D, Natural and Built Environment Baseline (Thematic Review). Appendix E, Issues and Objective Evaluation. Appendix F, Strategic Environmental Assessment. Appendix J, Habitat Regulation Assessment - Appropriate Assessment. Appendix K, The Metadatabase, GIS and Bibliographic Database is provided to the operating authorities on CD. It will be included in the final SMP. Appendix M, Review of Coastal Processes and Associated Risks at Hengistbury Head. Rowe , G.A. et al. 1990. The Infauna of the Handfast Point Maerl Bed. University of Southampton, Southampton. Scammell , F. Undated. The Church of St. Nicholas, Studland, Dorset. Booklet. Price �1. A small guide book that can be purchased in the church. "Scopac are contributing 15,000 pounds towards the monitoring of a trial which aims to place sand on the seabed and allow natural processes to push it onshore to replenish the beaches in Poole Bay. Poole Harbour Commissioners will provide the sand from the maintenance dredging of Poole Harbour entrance, thereby recycling the sand back into the system rather than dumping it offshore. The Sand Motor (or Sand Engine) concept has been widely used in the Netherlands since the 1990's given that it is cheaper and less intrusive compared with traditional beach renourishment approaches (The Sand Engine: a solution for vulnerable deltas in the 21st century? Coastal Dynamics 2013). The works at Poole Bay will be of national importance given the Sand Motor concept has never been trialled on heaches in the United Kingdom. The Marine Management Organisation (MMO) must first grant the licence to allow the placing of sand in the sea. A grant of 130,000 fro the placing of the sand will come from the Environment Agency. SCOPAC are supporting research and monitoring with a 15,000 pound grant subject to 60,000 pounds from the Environment Agency Research and Development fund. Sherry , D. 1973. Field Work in Dorset. Dorset Education Committee and Purbeck Press. Spooner , G.M. and Holme, N.A. 1960. Bottom fauna off the Dorset coast. Proceedings of Dorset Natural History and Archaeological Society, 82, 77-82. Stanfords Charts . 1989. Poole Harbour and Approaches 15. Barnacle Marine, Essex. Steers , J.A. The Sea Coast. Collins New Naturalist Series. Steers, J.A. 1948. The Coastline of England and Wales. Cambridge University Press. Steers, J.A. 1960. The Coast of England and Wales in Pictures. Cambridge University Press. Strahan , A. 1896. On the physical geology of the Isle of Purbeck. Proceedings of the Geologists' Association, 14, 405-406. Syratt , W.J. 1984. Wytch Farm Oilfield Development EIA: Volume 1: The Existing Environment - Poole Harbour and the Isle of Purbeck. BP Petroleum Development Ltd., Dorset. Teagle , W.G. 1971. South Haven Peninsula: Biological Changes since 1939. (Captain Cyril Diver, a memoir). Nature Conservancy, Furzebrook Research Station. Teagle, W.G. 1974. Species of Dragonflies and Damselflies mostly likely to be seen in the Sand Dunes Nature Trail. DEC ESL (Dorset Education Committee Environmental Studies Leaflet) No. 269. Teagle, W.G. 1974? The Studland Sand Dunes Nature Trail - a list of some plants to be found on the Trail. DEC ESL (Dorset Education Committee Environmental Studies Leaflet) No. 270. Teagle, W.G. 1974. Mollusc Shells Found on Studland Beach. DEC ESL (Dorset Education Committee Environmental Studies Leaflet) No. 271. Teagle, W.G. 1974. Studland Heath - Table of Bird Occurrence. DEC ESL (Dorset Education Committee Environmental Studies Leaflet) No. 272. Turner , N. 1994. Recycling of capital dredging arisings - the Bournemouth experience. In: Papers and Proceedings, SCOPAC Conference. Inshore Dredging for Beach Replenishment? Held on 28 October 1994, Elmer Court Country Club, Lymington, Hampshire. Tyhurst , M. F. 1976. Seabed Drifter Work in Poole Bay: A Study of Ten Years of Research. Document Ref. MFT/HF. Bournemouth Borough Council, Bournemouth. Underhill, J.R. and Paterson, S. 1998. Genesis of tectonic inversion structures: seismic evidence for the development of key structures along the Purbeck - Isle of Wight Disturbance. Journal of the Geological Society, London, vol. 155, pp. 975-992. By John R. Underhill and Susan Patterson. The interpretation of a densely spaced and well-calibrated seismic grid sheds new light on the development and evolution of key regional and local structures in the Wessex Basin. The results help to resolve long-standing controversies concerning the tectonic significance of apparently anomalous outcrop patterns and the role of important, local ancillary structures with respect to the major monoclinal folds with which they are associated. Although the structures are entirely consistent with the effects of contractional reactivation (tectonic inversion) of normal faults, the subsurface data demonstrate the role that original extensional fault segmentation and associated relay ramps had on original depositional patterns, subsequent inversion geometries and resultant outcrop patterns. As well as illustrating regional controls on the formation of structures, the new seismic-based interpretations enable a reassessment of the Lulworth Crumple and the Ballard Down Fault. The Lulworth Crumple is interpreted as a parasitic fold complex generated by internal folding of the inverted, incompetent syn-rift fill in the immediate hanging wall to the Purbeck Fault, a reactivated major normal fault. The Ballard Down Fault's origin is interpreted to result from the formation of a local, late-stage 'out of the syncline' reverse fault which propagated southwards and upwards through a Chalk succession. As the Chalk had already been rotated to form the northward-dipping steep limb of the Purbeck Monocline at Ballard Down, the structure cuts down stratigraphically. The results stress the importance of understanding the nature of original extensional fault geometries and the competence of the sedimentary units incorporated in folds in gaining a full understanding of the genesis and evolution of structural styles in inverted basins. Velegrakis , A.F. 1994. Aspects of the Morphology and Sedimentology of a Transgressional Embayment System: Poole and Christchurch Bays, Southern England. Unpublished Ph.D. Thesis, Department of Oceanography, Southampton University, 319pp. Velegrakis, A.F., Dix, J.K. and Collins, M.B. 1999. Late Quaternary evolution of the upper reaches of the Solent River, southern England, based on marine geophysical evidence. Journal of the Geological Society, London, 156, 73-87. Velegrakis, A.F., Dix, J.K. and Collins, M.B. 2000. Late Pleistocene - Holocene evolution of the upstream section of the Solent River, Southern England. Pp. 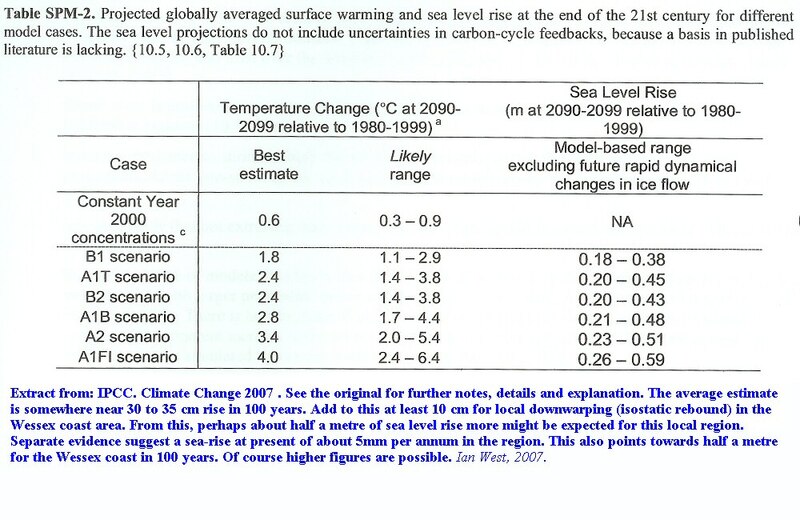 97-99 in: Collins, M. and Ansell, K. 2000. Solent Science - A Review. Elsevier, Amsterdam, 385pp. Wallace , T.J. 1955. The larger fungi of the South Haven Peninsula. Proceedings of Dorset Natural History and Archaeological Society , 77. Webster , T. 1816. in: Englefield, Sir H.C. 1816. A Description of the Principal Picturesque Beauties, etc., of the Isle of Wight. With additional observations on the strata of the Island, and their continuation in the adjacent parts of Dorsetshire, by T. Webster. Payne and Foss, London. Wilson , K. 1960. The time factor in the development of dune soils at South Haven Peninsula, Dorset. Journal of Ecology, 48, 341-359. Woodward , H.B. 1890. The geology of Swanage. In Braye, J. (ed.) 1890. Swanage (Isle of Purbeck) : Its History, Resources as an Invigorating Health Resort, Botany and Geology. 2nd Edition, Willaim Henry Everett and Son, Fleet Street, London, 119 pp. Wray , D.S. and Gale, A.S. 2006. The palaeoenvironment and stratigraphy of Late Cretaceous Chalks. By David S. Wray and Andrew S. Gale. Proceedings of the Geologists' Association, 117, 145-162. Abstract: Since the publication of Hancock's 'the Petrology of the Chalk' there have been numerous developments in our appreciation of the palaeoenvironment and stratigraphic correlation of the UK Chalk. This work presents a review of some of the key developments over the last 30 years. Our detailed understanding of Chalk lithostratigraphy and advances in our understanding of chalk sedimentation indicate that large-scale mass transport and re-sedimentation of chalks by low-angle suspension flows is required to explain the observed thickness variations. The provenance of clay minerals and the process of flint and granular phosphate formation are discussed. The growing importance of isotopic studies in high resolution stratigraphy and improving our understanding of the late Cretaceous oceans and climate are emphasized. Developments in lithostratigraphic studies and recent proposals for a new stratigraphic division of the Chalk in the UK are evaluated. 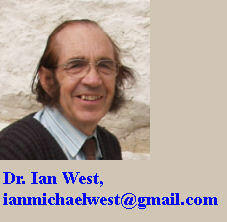 Authors' address - Department of Earth & Environmental Sciences, School of Science, The University of Greenwich, Chatham Maritime, Kent ME4 4TB, UK. Copyright © 2015 Ian West, Catherine West, Tonya Loades and Joanna Bentley. All rights reserved. This is a purely academic website and images and text may not be copied for publication or for use on other webpages or for any commercial activity. A reasonable number of images and some text may be used for non-commercial academic purposes, including field trip handouts, lectures, student projects, dissertations etc, providing source is acknowledged. Disclaimer: Geological fieldwork involves some level of risk, which can be reduced by knowledge, experience and appropriate safety precautions. Persons undertaking field work should assess the risk, as far as possible, in accordance with weather, conditions on the day and the type of persons involved. In providing field guides on the Internet no person is advised here to undertake geological field work in any way that might involve them in unreasonable risk from cliffs, ledges, rocks, sea or other causes. Not all places need be visited and the descriptions and photographs here can be used as an alternative to visiting. Individuals and leaders should take appropriate safety precautions, and in bad conditions be prepared to cancell part or all of the field trip if necessary. Permission should be sought for entry into private land and no damage should take place. Attention should be paid to weather warnings, local warnings and danger signs. No liability for death, injury, damage to, or loss of property in connection with a field trip is accepted by providing these websites of geological information. Discussion of geological and geomorphological features, coast erosion, coastal retreat, storm surges etc are given here for academic and educational purposes only. They are not intended for assessment of risk to property or to life. No liability is accepted. This website should not be used for other than its academic purposes.